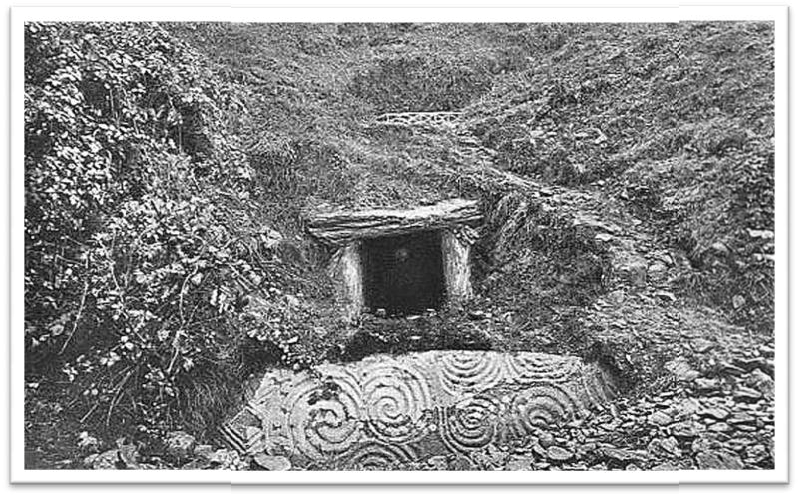 Scholarship does not know definitively what the spirals at Ireland’s most famous tomb and monument—New Grange, meant to the Celts or their forbearers. Scholars remain on the outside of this mystery, studying the facts. Is there a way into this 5000 year-old mystery, into an experience of this mystery? Its very sound has a compelling pull on me. I hear my breath expel softly as the word is spoken. Its sound conveys breathing—mostly breath, with no hard consonant “stops”. I look up its meaning although I already know that “spire” means to breathe. This word also has two other meanings: a single turn of a spiral and a tapering, rising to a point, like a church spire. All three meanings, of breath, spiral, and tapering, are now independent of one another in our daily usage. But their sounds echo with one another—an echo of the past? This preliminary “word work” already triggers a memory. Spirals and vortices have frequently appeared in my dreams over the years. Part of my subsequent research took me to the Celtic world where spirals of course play a prominent role. I learned that Celtic scholarship could not discover any definitive meaning for the many spirallic forms found on Celtic artifacts. While engaged in this research, I remember seeing an ancient rock carving depicting human figures with spirals emanating from their mouths! I saw it, I swear, yet to this day I cannot find any reference to it in the archeological world. I am left with an intriguing hint from memory that spirals and speech belong together, somehow. But the archeological world of buried facts is not the only “portal” to our spiritual heritage—our dead past. Our spiritual heritage is also buried deep within our language, yes, as the past, but that past still living within our language, or as language’s very within-ness. I return to my word work. In our modern language, as standardized by the dictionary, “spire” has three separate meanings, each seemingly unrelated to the others—all hidden within the word “inspiration”. Breathing seems so unrelated to spiraling and tapering. I decide to dig more deeply into the living history of meanings residing in our everyday use of words. A spire, as one turn of a spiral, arises from spira, which means, “to coil.” A coil is a connected series of spirals, as in a coil of rope. “Coil” comes from colligere, Latin for “collect”. This makes sense since a coil, in collecting spires together, becomes a coil in the first place. The word “collect”, as I said, arises from the Latin colligere and this word emerges in turn from the etymological root, leg-, which, as well as meaning to collect and gather, as in the Latin legere, from which one meaning of religion is derived—a sacred gathering, has a derivative meaning of “to speak”, or logos, with an inflection in meaning of speaking enchanted words. So, I now find buried within the word “inspiration” meanings of “breath”, “sacred gatherings”, “enchanted speech”, “spirals”, and “tapering to a point”, as in a church steeple. I have at last penetrated the historical depths of language to the forgotten psyche, the ancient living past, as reconstructed in modern consciousness, and an image is thus released! The magnificent ruins of New Grange now appear before my eyes. I see a mouth, from which emanates a collection of spirallic forms, directed perhaps to a sacred gathering below, radiating outwards from the center, like a sector of a circle. Now from the listener’s standpoint, I see a rising and tapering to a point, to the place where enchanted, inspired speech emanates from the high priest standing at the mouth of the cave: priest—the cave’s chosen mouthpiece, inspired to speak the cave’s spirallic wisdom out to the people waiting below! New Grange, magnificent ruin of a long-gone culture, now lies mute, as its former mystery is appropriated to the needs of a growing tourist industry. But the real New Grange still lives, yes, still “out there” in the real world, as the real world—its very Being. But it too lies mute—mute for thousands of years. It needs its modern priests, its mouthpieces, in order to speak. It speaks in spirals, vortices. What would such speech sound like, and where would its meaning take us if we spoke its turnings as they coil around us? John C. Woodcock holds a doctorate in Consciousness Studies (Ohio, 1999). His thesis addressed the process and outcome of a spiritual ordeal that lasted twenty years. Following this difficult period, John began to perceive the deeper objective psychic movement underlying his personal crisis and refined my articulation of this movement in twelve subsequent books. John currently lives with his wife Anita in Sydney, where he teaches, writes, and consults with others concerning their own journey, in his capacity as a Jungian psychotherapist.